Review: Told in alternating narratives, we follow Avery in present day and Rill in the 1939. Avery's father is a state senator and she's an attorney who is being groomed to take over for him. When she encounters a woman at a nursing home who is adamant that Avery's grandmother's bracelet is her own, Avery begins to research her grandmother's history. Rill is the eldest of 5 siblings living along the river with their carefree, gypsy parents. When her parents head to the hospital for the birth of her new sibling, Rill and her siblings are picked up by the police and placed in the Tennessee Children's Home Society. 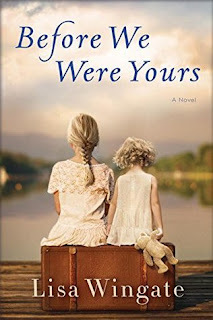 This book has been compared to Orphan Train and while both books follow similar narratives, I found this a much more compelling and well-written. While Avery's storyline was the weaker of the two, I still enjoyed her narrative and how she didn't let anything deter her from her research. The 'romance' part of the book wasn't completely necessary but didn't bother me. Rill's storyline was the highlight of this book. Inspired by true events, we learn how Georgia Tann, the head of the organization, tricked poor parents into signing away their parental rights and sometimes even stole children that were later adopted out for exorbitant fees. In many cases, she blackmailed the families who adopted children. The conditions at the TCHS were beyond horrific, rampant with physical, emotional and sexual abuse and even murder. Overall, this was heartbreaking but uplifting at the end. Very good read about a part of history I didn't' know about. Do we carry the guilt from the sins of past generations? If so, can we bear the weight of that burden? Life is not unlike cinema. Each scene has its own music, and the music is created for the scene, woven to it in ways we do not understand. No matter how much we may love the melody of a bygone day or imagine the song of a future one, we must dance within the music of today, or we will always be out of step, stumbling around in something that doesn’t suit the moment. I let go of the river’s song and found the music of that big house. I found room for a new life, a new mother who cared for me, and a new father who patiently taught me not only how to play music, but how to trust.